If you narrow your focus to the back wall (tough, I know) you can see some of their past projects- including a groundhog, jack-o-lantern, choir singer, presidential profile, butterfly and flower basket. 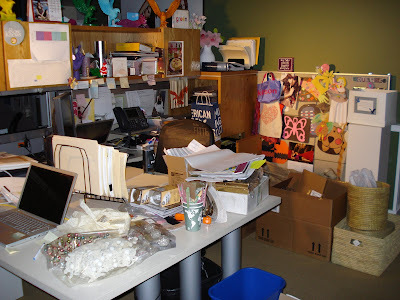 So last week, we were sent a special Thanksgiving package, that had coffee filter turkeys, and “Trees of Thanks”. The turkeys were great as always, but the trees were really something special. 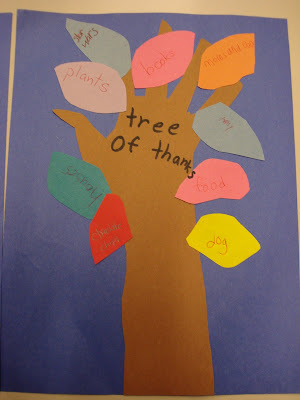 Each child traced their hand to make the trunk and branches, and then added paper leaves- writing something they are thankful for on each one. 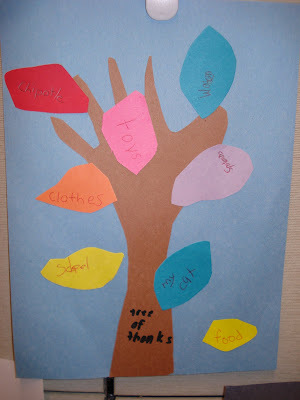 There were lots of leaves with expected items- Family, Friends, School, Pets, were big, but the ones that really got me were the more unique notions. A couple favs: “cookies that I eat” (I mean…great point…who is thankful for cookies that you don’t eat?? ), “costumes” (yes. YES. ), “chipotle” (written by the same kid that listed “food” and “water”….this might have been Dustin’s….) and “pres BD” (I think this is just an indirect way of saying “free day off of school”, which I’m totally down with). My family actually has done a similar project for the last two years over Thanksgiving….We each get a paper “4” and write what we’re “Thankful 4”, and hang it on the Tree of Thanks. 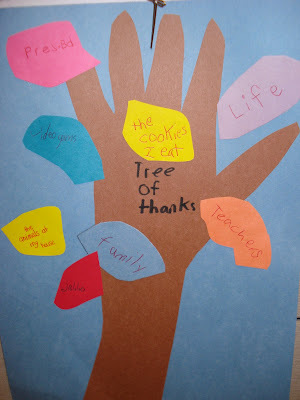 I also think it’s important to say thanks for all the little things that make life just a little bit better. Because as one of the students accurately recorded- where would we be without chocolate chips? Sunshine on my shoulders (makes me happy). This made me laugh...I love kids art work. It was fun to see a picture of your cube at work! Dustin- ponytails and prime numbers??? 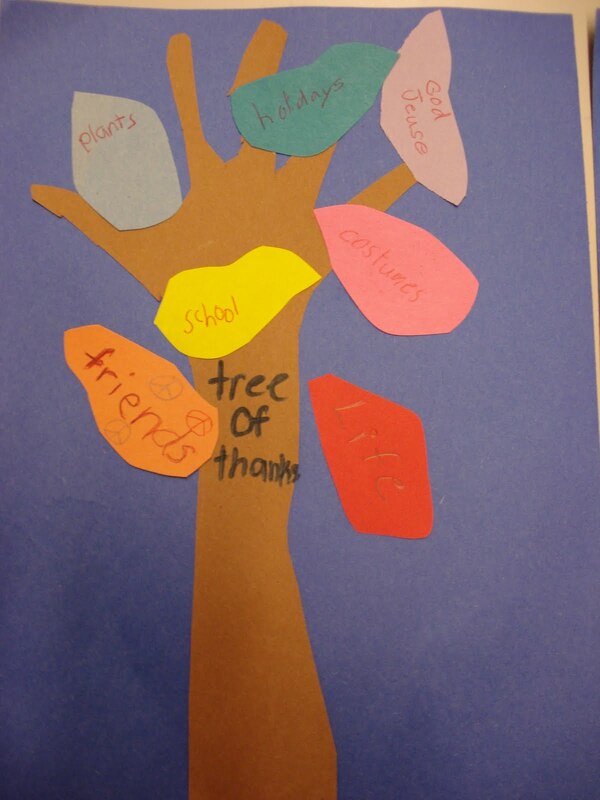 Love, love, love the Thankful "4" tree!!!! 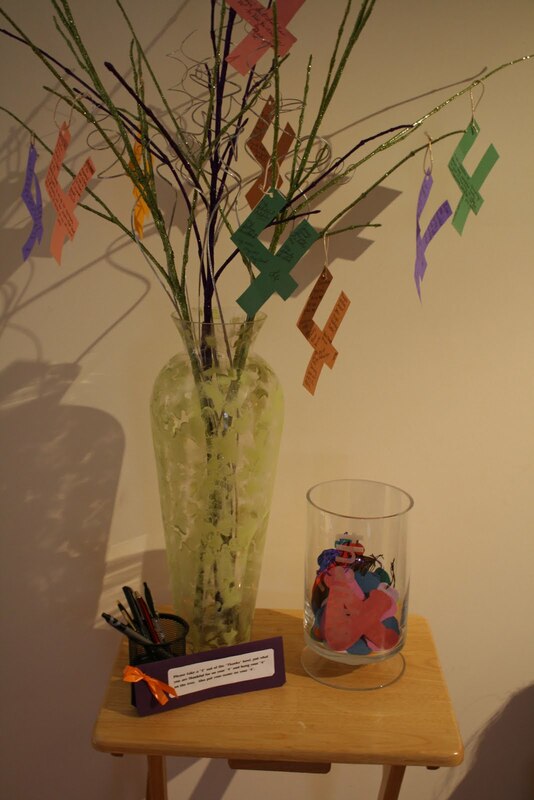 ponytails are simple and beautiful and prime numbers are awesome! What are your favorite numbers? The evens? BAHAHAAHA! One question for Dustin: Girl ponytails or man pony tails? It makes a big difference in my impending judgment of you. Also, for real I'm thankful for you guys. I know that's more of a big, overarching, it-will-be-on-my-top-10-list-for-life kind of thing, but it's true. Also... surprises, mangos, meeting family at the airport, chunky snowflakes, Matthew 11:28-30, graphing calculators, knitting needles, and electricity. i. love. this. the kids' projects are priceless, and that's so cool of your mom. love the thankful "4" tree, as well. thanks for sharing! Dustin - some folks already beat me to the "ponytails" curiosity... but nail clippers? Really?